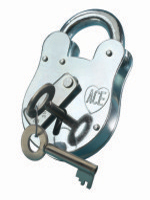 - Traditional "Old English" Padlock fitted with steel swingbar keyhole cover. - Available in 38mm, 51mm or 64mm body sizes. - All sizes available assembled with 2 or 4 levers. - All brass internal parts. - 12 differs supplied as standard. Additional differs available upon request. - Supplied with 2 steel keys. - Not available Master Keyed.